Sunday, the third day of the Big Island Beer Festival, I mean, Thermal Research Junket, turned out to be the best day of the lot. More people managed to stay up for longer than on any previous day, including several first timers. I had to land because I was worn out and hungry. Then when we heard Russell's excited voice over the radio exclaiming that he had finally caught one, and was coring it to cloudbase, we knew it was a momentous day. Apparently he even passed cloudbase a few times during that session. Congratulations to Russell on his thermal enlightenment! Cliff did great job on his first flight there as well, and Sandy, who is of course a thermal veteran, finally scored a sweet day flying leisurely laps at cloudbase. Jim had a great flight (or two?) and continued to work on improving his bump tolerance, and Bob and Ray both sharpened their thermalling skills over the course of several flights. Raygan got a nice tandem from Ray, and Jiah joyfully strapped herself to Peter for what must be a record four tandem flights in a single day. Our host at the B&B, Miles, decided Jiah might actually be a Sky Bunny, after he passed her several times during the day as she was waiting by the side of the road for a retrieve, clad in a stylish flight suit and surrounded by fancy gear. That might be a great nickname for one of our newest aspiring pilots. What a great weekend! This impromptu junket brought twelve flying monkeys over from Oahu, around half of them for the first time, and we were greeted with gracious hospitality by at least ten local Big Island pilots who came from all corners of the isle to meet us and make us feel welcome. Our sincere thanks to all of you: Charlie, Gene, Moku, Scotty, Neil, Eric, Yeti, Sean, Matt, Joseph, and anyone else I'm forgetting. And thanks to Bob, Jim, Russ, Sandy, Ray, Dave, McStalker, Peter, Jiah, Raygan, and Cliff for blowing off your weekend plans to help make the most of three great days of flying and partying at Kealakekua. I had a really great time, at least the parts I can remember. Thanks to Bob for arranging the 4WD from Hilo, to Jim for the 4WD from Kona, and to Russ for the Minivan. Thanks to Raygan and "Sky Bunny" Jiah for all the retrieve driving. We had twice as many flights because of you guys. And finally, our many thanks to Greg, Miles and Elena for providing us with such fabulous accomodations at the Ah Paradise B&B - I have no doubt that each one your nine happy guests will be saving up for another visit as soon as possible. Great to meet all of you wonderful folks. Happy to see so many smiles from thermal exhaustion. You know the lift was plentiful if I managed to stay up without power. Thanks to all the local Kealakekua gang for hosting! 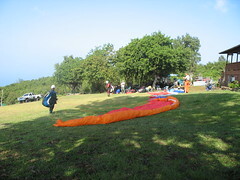 This type of event helps bond the whole Hawaiian paragliding community. Looking forward to flying with the monkeys again sometime soon. Thanks to so many for a helluva weekend! Thanks to Charlie, Scotty, Moku, Neil, Yeti, Eric and all the locals for their great local site advice and hospitality! I hope they'll pass along our appreciation to "Uncle Billy" and his family for their kind tolerance and hospitality. Miles and Greg and their Ahhhh...Paradise B&B were great. I highly recommend it to fellow pilots and all travellers to the Kona area. It's just a stone's throw from the LZ and Miles said they can even provide rides to/from the LZ when they're around. Thanks to Bob and Raygan for *trying* to keep us organized and to Raygan, Jim, Neil, and Moku for shuttling us up (and down :-|) the hill. It was a great challenge hunting for those wiley thermals. I give you guys alot of credit for figuring that site out and keeping it going. If I forgot to mention anyone, well, you know, it was an exhausting weekend, too. It was great hanging out with everyone, and I look forward to our next gathering. Hey . . . why is it that, Raygan "'got a nice tandem' from Ray", while Jiah "'survived' four tandem rides from Peter"? Four Tandems in one day!!! That's seems like quite a note worthy Instructor/student accomplishment. She got to experience quite a lot: Thermaling, scratching, sled-riding, flying the glider, no wind landings, flying through the rain . . . and . . . lots and lots of packing-up!!! Good job Jiah!!! You can fly with me anytime!!! Upon humble reflection, I have to say I agree with Peter: the verb I used was inaccurate and infelicitous. The fact is that we were all lucky to have survived all manner of hijinx over there. I am changing my phrasing to one that more appropriately reflects the carefree and generous spirit of the day. Peter, please accept my sincere apology for unnecessarily perpetuating a reputation that you are clearly working hard to put behind you. I look forward to seeing many more fun and safe tandem flights from you, and having a few myself. I'm glad you came on the trip and I know Sky Bunny appreciates your generosity with the tandem flying. Mahalo Alex . . . it was a great trip!!! as an asdide . . . thanks to an abundance Sauvighon Blanc, I am on my way to Comfortable Numbness . . .